Snowy Mountain Lodge has a very unique history that dates back to the early 1900’s when the lodge’s Conference Room was a small home nestled in the mountains. Through the years and the lodge’s many owners, the original structure has been added on to, renovated and modernized several times. Today, the lodge is owned and operated by Laramie Valley Chapel in Laramie, Wyoming. They purchased it in 2011 with a desire to see the place restored and opened to the public, both as a lodge for guests and as a retreat center for ministries throughout the region. For most of the winter months, the lodge is a home-away-from-home for many winter sports enthusiasts as they enjoy the close proximity to the ski area and snowmobile, snow shoe and cross country trails. In the summer, retreats and camps are able to use the property for their events. The future of lodge is sure to bring many more improvements to the facilities and property as well as many new memories to the guests who come for a retreat. We would like to take a minute to thank all the volunteers that helped with renovations at the Lodge. One group included 46 men and women from Georgia and the surrounding states were here for a week to kick off a great summer of renovations at the Lodge. 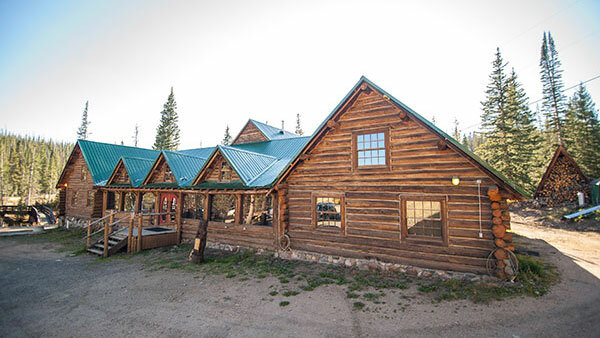 Whether you are looking for a quiet weekend get away, a home base for a week of snowmobiling, or a mountain base camp for your next backpacking trip, the facilities of Snowy Mountain Lodge are ready to serve you. Watch this video for a quick tour of our renovated facilities! Click Here for more information on what the area has to offer! Visit Snowy Mountain Ministries to book your next ministry event!